Arts and Blues on Bedford continues! Cricket Semi-Finals in Bridgeport and New Milford. The weather ain't lookin' too great (sorry, I have a Dale Earnhardt, Jr. show on as I'm websurfing), but we'll see if some of Sunday's events can escape the predicted scattered thunderstorms. Also, Patriots vs. Jets at 4:15 should be an interesting match up. 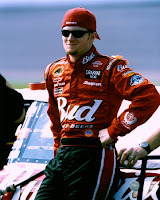 Hmm, that reminds me, I need to add Dale Earnhardt Jr. to my list of celebrity crushes.